People and a streetcar cross Yodabashi Bridge in Osaka. The building on the left is the Osaka branch of the Bank of Japan, located on Nakanoshima island. It was designed by Tokyo University Professor Tatsuno Kingo, and completed in January 1903 (Meiji 36). Across from the Bank of Japan some wooden structures can be seen. 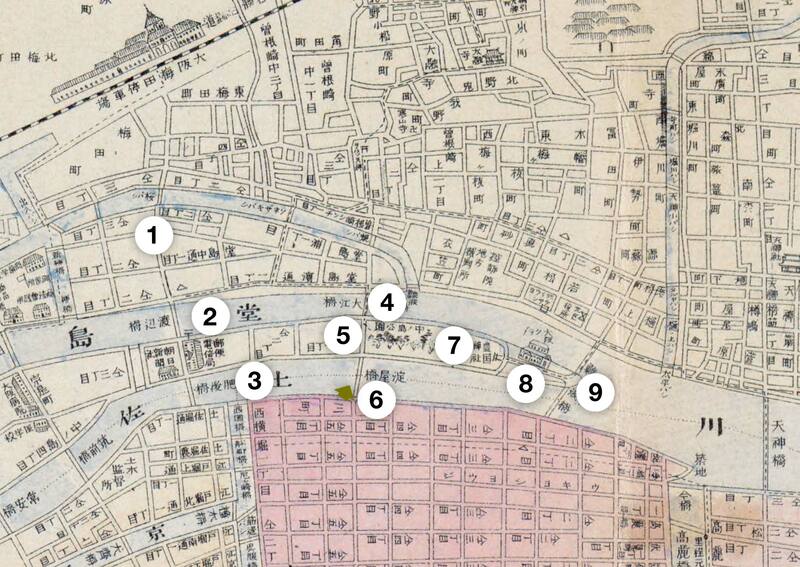 Eventually these would be torn down to make way for Osaka City Hall, which was built between 1918 (Taisho 7) and 1921 (Taisho 10). What makes this postcard especially interesting is the arch in the back. This is the Triumphal Arch in Commemoration of the Victory in the Russo-Japanese War (1904-1905). 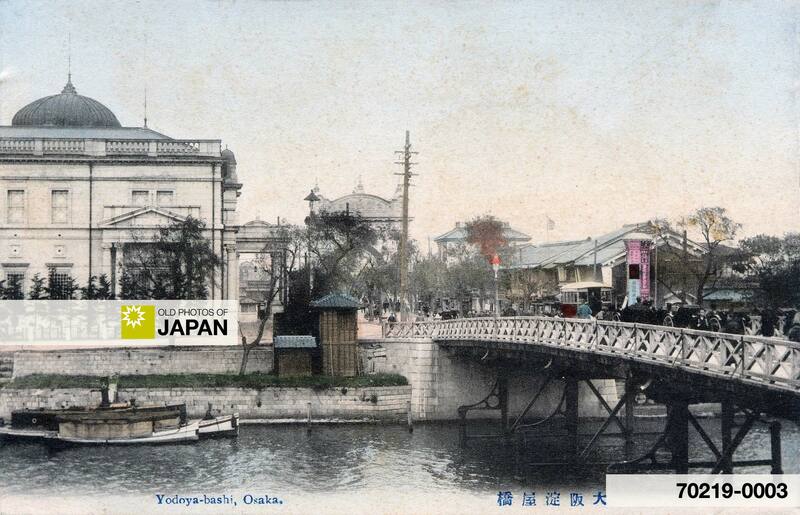 The arch was constructed by the Osaka city government on November 30, 1905 (Meiji 38) on the south-east end of Oebashi Bridge on what is now Midosuji Avenue for a total cost of ¥5,000. Intended as a temporary construction, it consisted of a framework of wood covered with plaster. Returning Japanese troops marched from Osaka Harbor and passed under it on their way to Osaka Station in Umeda, all the while being cheered by Osaka citizens. On December 26, only one month after its construction, the Triumphal Arch was destroyed by fire. Neighboring roofs crowded with spectators, the Osaka Fire Department tried heroically to extinguish the fire. But although they put the fire out after one hour, they failed to save the structure. 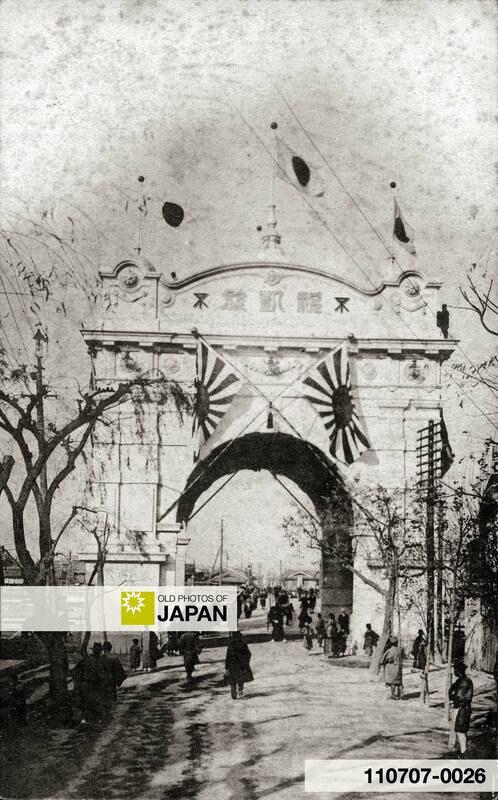 Nowadays very few people know that Osaka ever had a Triumphal Arch. People think of Paris or Rome for such things, Osaka is the very last place that comes to mind. 1 Yomiuri Shimbun Shakaibu (1987). Scenes of Naniwa: Osaka Time Tunnel. Warajiya Publishing Co., Ltd, 101-104. You can also licence this image online: 70219-0003 @ MeijiShowa.com.